This textbook covers first-order language in a method appropriate for first and second courses in logic. The unique on-line grading services instantly grades solutions to hundred of computer exercises. It is specially devised to be used by philosophy instructors in a way that is useful to undergraduates of philosophy, computer science, mathematics, and linguistics. The book is a completely rewritten and much improved version of The Language of First-order Logic. Introductory material is presented in a more systematic and accessible fashion. Advanced chapters include proofs of soundness and completeness for propositional and predicate logic, as well as an accessible sketch of Godel's first incompleteness theorem. 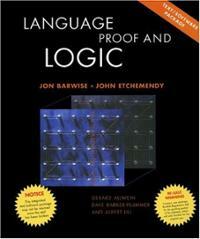 The book is appropriate for a wide range of courses, from first logic courses for undergraduates (philosophy, mathematics, and computer science) to a first graduate logic course. Jon Barwise (1942-2000) was a mathematician, philosopher and logician. He taught at the Universities of Yale and Wisconsin before becoming the first director of the Center for the Study of Language and Information at Stanford University. From 1990 until his death he was professor of philosophy at Indiana University. John Etchemendy has been professor of philosophy at Stanford since 1983. In 2000 he became Provost of Stanford University.